Joseph Corona, an Employee Benefit Specialist (EBS) for Stanford Health Care, shares his experiences at the picket organized by SEIU-UHW (JESSICA ZHANG/The Stanford Daily). 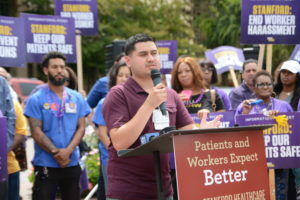 Joseph Corona, a housekeeping assistant for Stanford Health Care, shares his experiences at the picket organized by SEIU-UHW (JESSICA ZHANG/The Stanford Daily). Hundreds of demonstrators from all over California showed up in support of frontline workers at Stanford Medical Center. Armed with purple banners, megaphones and noisemakers, they chanted “Stanford, Stanford, you can’t hide, we can see your dirty side!” as they paraded around the hospital’s entrance. Meanwhile, Stanford Health Care (SHC) is trying to reach agreement with the union workers, participating in meetings and negotiations to work with union demands. This picket was organized by the Service Employees International Union – United Healthcare Workers West (SEIU-UHW), one of the largest unions of hospital workers in the western United States, voicing allegations of worker intimidation. Complaints arose from a union-organized July 11 press conference to apparent concerns over irregularities in worker training and sanitation policy. Hospital administration created a website dedicated to informing the public of the negotiation process that started July 15. The most recent meeting was held on Aug. 2. An official Stanford Health Care/Stanford Children’s Health media statement has been issued in response to this picket. Additional negotiations are planned for Aug. 9, 16 and 23. The current union contract expires on Aug. 29. On July 26, 2017, SEIU-UHW organizers joined a National Labor Relations Board charge against SHC, alleging that union-affiliated employees were harassed, threatened and intimidated for their role in a July 11 press conference discussing infection rates at the hospital. Joseph Corona, a housekeeping assistant at SHC who participated in the July rally, claimed to have been the subject of scare tactics by management for his role in the issue. Tom Parker, a spokesperson for the SEIU-UHW, alleged that workers were prevented from attending the Aug. 3 informational picket. “I only have it second-hand, but I’ve been told that workers, particularly in the housekeeping department, were told that they couldn’t come out. The only way they could come to the picket is if they were on their break or off their shift,” Parker said. The claim was repeated by several other union demonstrators at the rally. Although 500 people were expected to participate, organizers estimated the crowd top off at 300. SHC Corporate Communications and Media Lead Patrick Bartosch said the union has previously pressured SHC to meet union demands, dismissing allegations of SHC preventing employees from picketing and accusing the SEIU of bringing in outside demonstrators to misrepresent hospital staff. For the second year in a row, the hospital has had its Medicare subsidies reduced by the Center for Medicare Services (CMS) for infection-related issues, according to Healthcare Finance and the CMS website. On a CMS scale of the number of hospital-acquired infections with ten being the worst level of infections, SHCHC scored a seven out of ten. One of these major concerns is of Clostridium difficile (C. diff), a bacteria that causes inflammation of the colon and can lead to extreme diarrhea, abdominal pains, nausea and fever. The bacteria is spread through contact with infected area and can live for long periods of time on surfaces. The problem is that patients have been acquiring the disease after being admitted into the hospital for other infections. In a Feb. 2016 article, however, Lucy Becker Professor in Medicine and Microbiology and Immunology Lucy Tompkins attributed high C. diff rates to a more stringent test, a fact that government regulatory bodies do not include in their data. Union members alleged that these issues arise from poor training and education, chronic understaffing and communication issues. In the Aug. 3 press conference, several SEIU members shared their concerns with management policy. Salyna Nevarez, an SHC phlebotomist, spoke about how understaffing leads to cutting corners. Nate Anderson, a transporter who moves patients in and out of the hospital via gurneys, spoke about a transition from bleach wipes to alcohol wipes and OxyCide. When he questioned the effectiveness and availability of these new cleaning materials, he claimed to receive unsatisfactory answers from his directors and managers. SHC responded to charges of quality issues by pointing toward distinctions in other metrics. The union rally received support from several local elected officials. Vice-mayor of East Palo Alto Ruben Abrica attended to show his support for the union’s efforts. Ultimately, however, negotiations must occur between SHC and SEIU-UHW leadership. Linda Cornell, a unit secretary at the hospital and prominent speaker for the union, claimed that the hospital officials have neglected SEIU demands. “We initially tried to set up a meeting with the CEO and he agreed, but then he sent a message back to us [with] restrictions: the meeting would be with HR, not the CEO; that he was going to restrict who could be at the meeting and he was going to restrict what could be talked about,” Cornell said. Medical center officials, on the other hand, iterated their commitment to a fair bargaining process. Bartosch explained that they have had seven bargaining sessions so far, offering economic improvements and careful consideration of SEIU-UHW proposals. “Our pledge throughout these negotiations is to bargain in good faith to reach a mutually acceptable agreement that provides wage increases and other improvements that support our employees and their profession,” Bartosch wrote. This article will be updated with further comment from SHC administration. Correction: A previous version of this article misstated Joseph Corona’s title as an Employee Benefit Specialist, when Corona is in fact a housekeeping assistant, or Environmental Services worker (EVS). Additionally, spokesperson Tom Parker was incorrectly listed as community organizer Tony Parker. The Daily regrets these errors. Contact Matthew Lee at 18matthewl ‘at’ students.harker.org and Jessica Zhang at jessica ‘at’ stanforddaily.com.